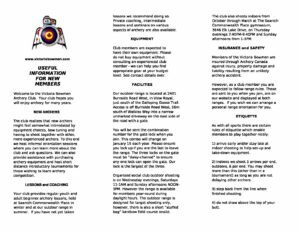 Victoria Bowmen’s brochure for new archers, including details on the sport, Club history, types of archery, Club facilities, coaching, equipment, the JOP, and more. Victoria Bowmen’s brochure for new members, including lessons and coaching, equipment, club facilities, insurance and safety, range etiquette, and more. The BCAA has recently revised / updated its Tournament Hosting Package. This document is to be circulated to Club boards. Revenue and Expense Report PDF for the use of members of the Victoria Bowmen Board of Directors.